With silky and smooth non-irritating bamboo rich fibres woven into a very breathable, light net, Elle Sport Mesh Bamboo No Show Socks are absolutely superb at keeping feet cool and fresh, even during gym activity. Bamboo is naturally good at managing temperature, wicking moisture and shunning bacteria, so you’ll stay dry and odour-free for longer. 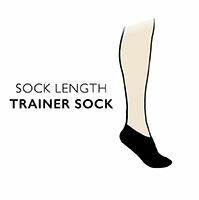 These low-cut socks are designed to vanish when worn in most shoes and trainers, but they are also highly efficient at looking after feet, so you’ll be forgiven for possibly forgetting that you even have them on! Hand linked toes for smooth seams protect skin from rubbing and blisters, and, in a triple pack, you’ll always have a fresh pair ready for wear!